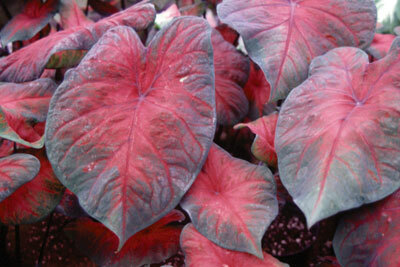 And damn it, THIS one I was thinking of, but the only one I knew the name of was the Coleus. So the juice of that plant, Iresine, may be used to help extract the compounds from the ayahuasca plant. I have read a bit more about this Iresine plant, and I have not read about any warnings while handling this plant or its leaves. And I think that is what we should be looking for: one of the mentioned plants must be sort of dangerous to handle while potting it or cutting it. A Hiram Bingham le contraron sobre la existencia de una planta con cuyos jugos los incas ablandaron las piedras para que pudieran encajar perfectamente. Hay registros oficiales sobre esta planta, que incluye a los primeros Cronistas españoles. Después comprobaria tal versión: Un dia, mientra acampaba por un rio rocoso, él observó un påjaro parado sobre una roca que tenía una hoja en su pico, vio come al ave depositó la hoja sobre la piedra y la picoteó. El påjaro volvió dia siguente. Para entonces se habia formado una concavidad donde antes estaba la hoja. Como este método, el ave creó una "taza" para coger y beber las aguas que salpicaban del rio. Teniendo en cuenta el hecho de que el liquen ablanda la piedra para atar sus raíces bajo terra, y quizås considerando la extinción continuada de especies de esta planta, esta noción no es mås que improbable. I hope I am not the only one here who is able to make some sense of the Spanish used in that document. Zoología Mapuche. El Enigma del Påjaro Pitiwe y la hierba que disuelve el hierro y la piedra. Mapuche Zoology. The Enigma of the Pitiwe bird and the herb that dissolves iron and stone. Existe en el territorio mapuche un pájaro, de los llamados "carpinteros", que guarda un profundo secreto. Secreto que celosamente comparte con los renü (sabios y sacerdotes mapuche): la planta que disuelve la piedra y el hierro. In the Mapuche territory there is a bird called "carpenters" which guards a profound secret. A jealously shared secret among the Renü (Mapuche sages and priests): the plant that dissolves stone and iron. well you have certainly been busy with some research, nice one! And its so much more interesting to read than to just have a video posted! We may never find the definitive answers, but we are a lot closer to 'any' answer by looking for one - than by not looking. If you hadn't come up with that name for the herb, I would never have gotten very far. So thank you in return. Who would have thought that Woody Woodpecker could maybe lead us to solving the mystery, lol! Keep up the good work Abe!! yes, but how did the woodpecker know these things? 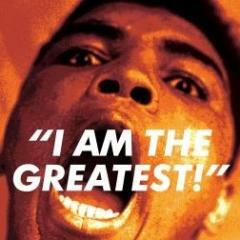 Obviously aliens told him, after all who are we to think that ET will onlu talk to us? 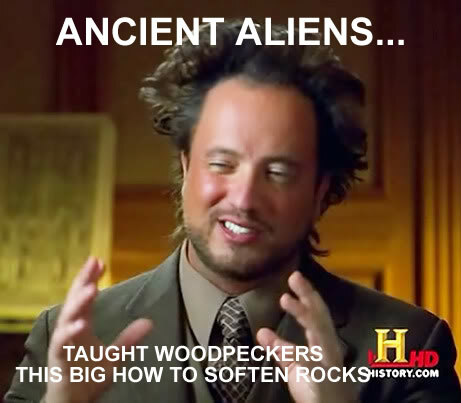 yes its true, even Giorgio Tsoukalos explores this in an upcoming AA series...BIRDS ARE ALIENS BEST FRIENDS! 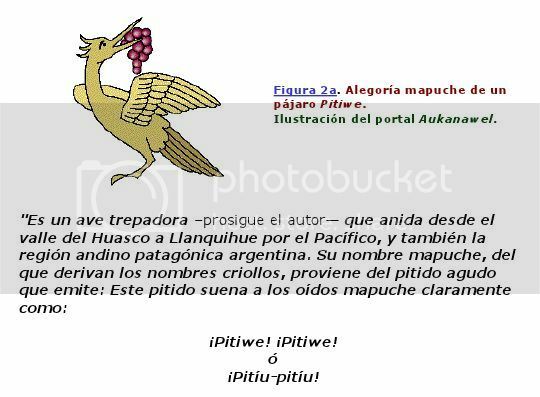 Aukanaw, in his text devoted to the enigma of the Pitiwi bird and the herb that dissolves iron and stone, reminds us of the existence of a plant considered medicinal by the Mapuche, which grows in the Andean highlands, from Ecuador to the Strait of Magellan . Botanists call it Ephedra andina, and is one of those suspected of being the famous and much sought after herb of the Incas. It is used as fodder, some llamas eat their leaves, stems and fruits - we assume they know how to do it without affecting them. Sheeps like to eat their berries. It has many uses in herbal medicine. Figure 17 . Ephedra andina in their natural environment. Image obtained from Hanfmediem portal. Figure 18 . Sketches descriptive of Ephedra andina. AG. Ephedra andina Poepp. Ex Meyer, A. Branch of a female plant (X 1); B. Female strobilus (X 50); C. Fruit (X 50); D. Branches of a male plant (X 1), E. Male inflorescence (X 50); F. Male strobilus (X 50); G. Male flower (X 50). Art Gallery. Digital Library of the University of Chile (Santiago). If you look at the images, then you'll see it looks nothing like plants with normally shaped, but spongy, and red to purple leaves. Plant exposures are some of the most frequent poisonings reported to poison control centers. Exposures to plants containing oxalate crystals, such as Philodendron and Dieffenbachia, are among the most common toxic plant exposures reported in the US. For the past 200 years, the irritant properties of the Dieffenbachia plant have had various uses, including punishing slaves and treating gout, impotence, and frigidity. Today, plants containing oxalate are admired for their ornamental beauty and found in public places and homes. Caladium is a genus of flowering plants in the family Araceae. They are often known by the common name elephant ear (which they share with the closely related genera Alocasia, Colocasia, and Xanthosoma), Heart of Jesus, and Angel Wings. There are over 1000 named cultivars of Caladium bicolor from the original South American plant. The genus Caladium includes seven species, which are indigenous to Brazil and to neighboring areas of South America and Central America. They grow in open areas of the forest and on the banks of rivers and go dormant during the dry season. The wild plants grow to 15–35 inches (40–90 cm) tall, with leaves mostly 6-18 inches (15–45 cm) long and broad. Caladium contains oxalate crystals causing burning and irritation when eaten. The guy I quoted from a page or so back said the plant we are looking for is common in florist's shops, and this one most certainly is. But are the leaves 'spongy'? "We have now found out what the plant is, what the leaf is, and it’s quite well known. It’s a very common plant. As a matter of fact, we use it for ornamental purposes. You can buy it in the stores, in a florist’s in New York. The Latin name escapes me, but its got ordinary sort of rather spongy-looking red leaves–it’s red and purple instead of being green. It has a substance in it that is a very strong alkali and not an acid." All this clown zoser has is fantasy, opinion and BS..... lots and lots of it. Buckets of that coming from the skeptics camp. Nothing substantiated, just fantasy on top of fantasy. Archaeological theories in tatters and very soon they themselves will be the fringe. Trust a Dutchman to bring us flowers to liven up the forum! I do realize this thread seems to go way off-topic. But the premise was that aliens were involved in the building of some of the megalithic structures we can find all over the world. And then that the way these structures look is a sign of some unknown, highly advanced technology. One of the possible answers is that the ancients - in this case, the natives of South America - used a chemical brewage based on herbal juices that was able to soften stone. And now we are in the process of finding out what plant that could have been. And how many specialists have you read about? Archaeologists never consult specialists. How about Chris Dunn and Roger Hopkins for a start. Comments from these experts have been posted here recently. I admire you for trying Abe I really do. There's a hell of a long way to go even if someone comes up with a plant that remotely fits the description. Too many logistics now fit the soft stone theory for it to be false. The very edges of the stone may become workable with the application of a rare chemical to allow say sculpting to take place on a stature, but for positioning the blocks at Sacsayhuaman and the various megalithic sites is quite another. By all means carry on. Besides, how can anyone determine the depth of the hole or shape, in your pic? Maybe use your eyes a little and read the post a little more carefully instead of assuming that you know what is said. I did provide the title of the video clip where the picture came from! At least there appear to be many sources talking about some plant able to soften stone. The positioning of the stones is quite another thing. But the protuberances found on many stones plus the ramps should give us a clue: ROPES and MANPOWER. What a cop-out! So you can only name 2, and both just happen to have appeared on the AA series, and BOTH are anti aliens as I pointed out way back. You see you fall for it all the time, the questions were trick questions, I KNEW you couldn't name any because your research only goes so far as watching a vid. And no 'specialist' worth his salt, and no archeologist wanting to keep his professional career, will ever mention aliens! And that's not to say they will think it, but never say it...they don't even think it to start with!! Youre just swayed by videos. The protuberances are way too small to get a rope around them! It would need half a dozen ropes to move those stones at Ollyantaytambo. I'll post some pictures later if I get time. The much smaller blocks have those on them too and some of them stick out less than an inch. Their purpose definitely wasn't ropes. Also they are not squared off enough for ropes to hold!